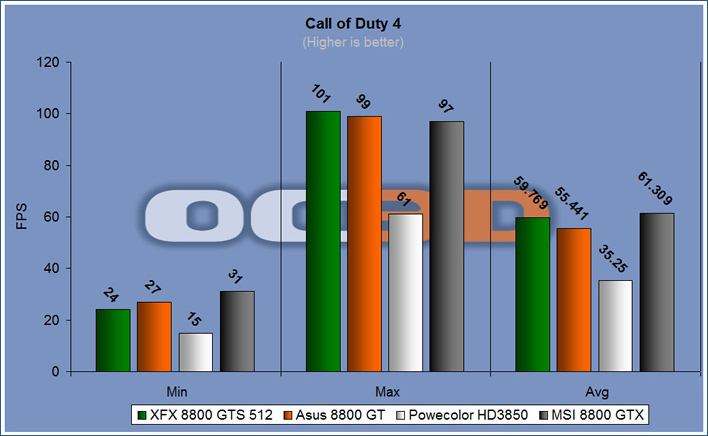 Call of Duty 4 is a stunning DirectX 9.0c based game that really looks awesome and has a very full featureset. With lots of advanced lighting, smoke and water effects, the game has excellent explosions and is fast and furious, perfect for our test suite. As you can see here, the 8800 GTS tops the pile in terms of highest FPS, but had a few slight dips in FPS at points. 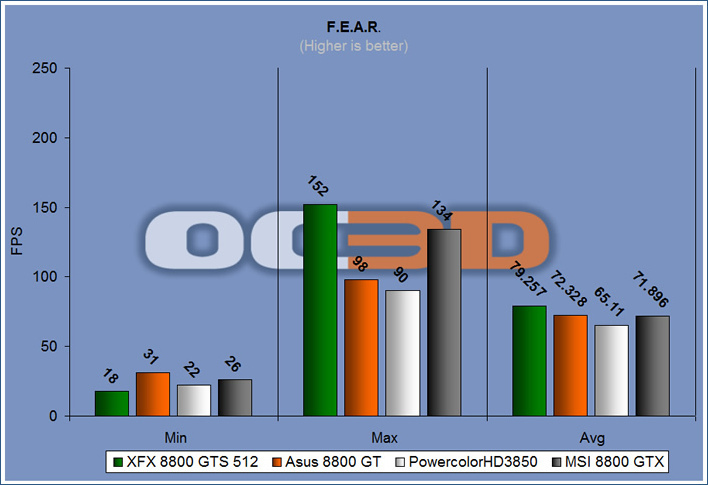 The 8800 GTX showed a more smooth overall performance through testing but, in all honesty there wasn't a whole lot to pick between any of the 8800 series cards and even the HD3850 kept up with the pace. F.E.A.R. is a game based on the Lithtech Jupiter EX engine. It has volumetric lighting, soft shadows, parallax mapping and particle effects. This is a fairly old game but was a very testing one at the time of release and still looks fantastic, so we've kept it in. F.E.A.R. always produces slightly odd results if you look at the fine details. However, as an overview, the XFX 8800 GTS was the best performer with the 8800 GTX and Asus 8800 GT not too far behind. All cards ran F.E.A.R. with no problem at all. Bioshock is a game based on the Unreal Engine 3. It uses some DirectX10 features such as awesome water and smoke effects. The detail level in the game, combined with a frantic pace makes for an excellent benchmark. 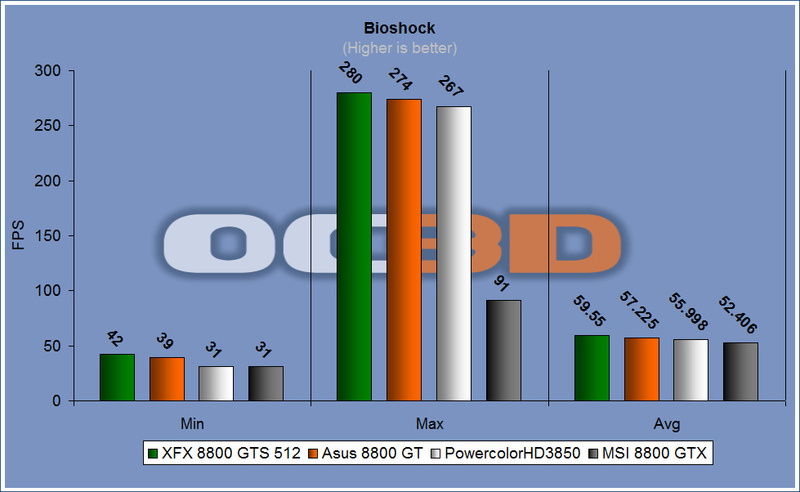 Bioshock again shows the trend for the GTS and the GT to be very quick. The 8800 GTX had a little "blip" in this game and I couldn't for the life of me figure out why it's results weren't as good as the other two 8 series cards, even after many repeat runs. Still, every card was smooth as butter in this game at this resolution.